movie “Cop Out” is directed by Kevin Smith. No essays, no searching for themes or comparisons to other abstract ideas. “Cop Out” is far too gloriously stupid to support anything like that. Jimmy Monroe’s (Bruce Willis) daughter is about to get married and he’s dedicated to paying for it, if for no other reason than to show up her jerk stepfather (Jason Lee). Which makes it the worst possible time for him and his partner (Tracy Morgan) to get suspended from the NYPD for letting a neighborhood get shot up in a drug buy gone wrong. His only choice is to sell his beloved Pathco baseball card, or it would be if he hadn’t gotten robbed by a clueless parkour enthusiast (Sean William Scott) during the sale. Cue the Harold Faltermeyer music. If someone explained the plot of “Cop Out” to me, I would say it sounds remarkably dumb. It’s something of an enigma; how can something this stupid be this good? But it is. Well, as long as your definition of good includes LOTS of d*ck jokes. “Cop Out” is marvelously juvenile. Not just in its somewhat typical situation comedy and sight gags, but from itsability (even desire) to frequently bring its plot to a shuddering halt so that its characters can engage in a few minutes of quiet ridiculousness. Which really shouldn’t be funny. Almost nothing is worse than listening to actors riff on each other unless they really know what they’re doing. But for the most part they do. Despite breaking into the biz as a comedian, his long career has left Willis playing the straight man most of the movie and he does it well enough, but that leaves the majority of the comedy in Morgan’s hands. Except for those rare few moments when Sean William Scott’s drughead thief Dave shows up to annoy everyone and steal their scenes. Intentionally annoying characters are very difficult, they have a tendency to succeed too well, making it hard to care about the comedy. But somehow Scott pulls it off through a constant up-beatness. “Cop Out” is the beneficiary of a strange alchemy that way. Everything in it should be awful, but isn’t, probably because of some actually witty–stupid but witty–dialogue from Robb and Mark Cullen, not to mention a few hilarious turns that you don’t see coming. Because it’s funny, and that trumps all. It’s a pretty good fit for Smith’s first piece of work-for-hire directing. It doesn’t sound like one of his movies, but the underlying structure is much the same and it gives him the freedom to expand on his visual story-telling – usually the weakest part of his particular style of films. It’s a little uneven though, with a jarring mixture of delivery styles as each actor tries to make it theirs. For Kevin Pollack and Adam Brody’s natural smart-assness that’s not such a stretch. But you’re going to have really like Morgan’s particularly brand of screaming misunderstanding because you’re going to have to sit through a lot of it as a lot of the plot (and attendant gags) concerns his constant concern that his wife (Rashida Jones) is cheating on him. In fact, despite the fact the entire plot revolves around Willis, you’d think the movie was more about Morgan’s troubles. It’s not constant, as occasionally he must impersonate a functioning police officer instead of a yelling man-child, but if Morgan doesn’t work for you “Cop Out” will be intolerable. It’s got a few other bumps here and there. 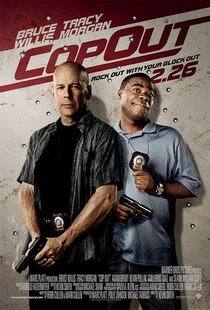 “Cop Out” is nominally an action-comedy, which means every so often the guns have to come out. Smith has Spoken self-deprecatingly about his visual inability as a director and his discomfort with action sequences, and he’s not been lying. Anything outside of a sight gag tends to move very slowly, granting us one of the more boring car chases committed to film. It’s definitely miles better than his first few tries in films like “Dogma” and “Jay and Silent Bob Strike Back” but it’s got some distance to go. But by God, the man knows how to tell a d*ck joke. “Cop Out” is very much a movie for 10-year-olds who never grew up but that’s okay, they need love, too. No one else will like it much but they’re not supposed to. It is what it is, a fun, stupid comedy that works far better than it should. There probably is no real explaining why. It’s funny, and that’s all that matters.